We are just so pleased she's back bringing us jazzed up pop music that doesn't sound like it was manufactured by bean counters to fit the specifications of a focus group's consensus. This is beautifully crafted, lyrically inventive music that sounds like nothing else out there. And that voice! More clear and pure than ever and able to glide effortlessly over the fastest grooves and shift from high to low without losing a beat. 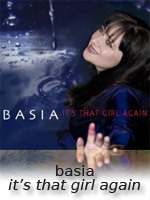 Basia's solo debut, Time and Tide, probably had more influence on what became known as NAC (New Adult Contemporary) vocal music than anyone except Sade. She released two more CDs, London, Warsaw, New York and The Sweetest Illusion before virtually disappearing from the scene. Her disappearance coincided with the radio format's shift from NAC vocals to pop crossovers and coincidentally (?) her label-mate Sade's output slowed down at about the same time. Now we are at a point where we need to redefine the music we call smooth jazz and get back to what made it special in the first place and It's That Girl Again writing the textbook on how it is done. Simply put, this is classy, smart, catchy pop music for grownups. A sense of optimism and joy permeates these songs, driven by bouncy bossa-nova influenced arrangements. It's a continuation of the songs she teased us with on Matt Bianco's "Matt's Mood" a few years ago, an update on the sound she and her band created on her earlier albums. The breezy advance radio track, "Blame it On Summer," sounds instantly familiar but completely original. The same musical themes carry through the opening track, "If Not Now Then When," a very smart love song, and the wise and uplifting "Winners," both mostly backed by acoustic guitar and percussion. "They Know Nothing About Us" is dark and brooding until it breaks into this irresistible chorus, "A Gift" is almost chant-like with layered vocals, similar to an Enya song but without all the bombastic effects. She even ventures into the big and theatrical on "I Must" and "Amelki Smich," which is sung in her native language. Lots of these songs have multiple melody and tempo shifts, going from fast to show, from dance floor electronica to brazilian jazz to anthemic choruses. The wonderful thing how different they are from each other and from what has become standard Adult Contemporary fare. The lyrics, inspired by her friends, family and experiences over the last few years, are insightful as well as being very clever. Welcome back, Basia. This album is a treasure. This time around, stay with us and continue to share your journey!